Of all the veggies, Potatoes are considered to be very humble. They are so versatile.. you can boil them, steam them, barbecue them, mash them , saute them and even roast them. Whatever form it takes, it tastes wonderful. There are many ingredients which go along with potatoes very well. 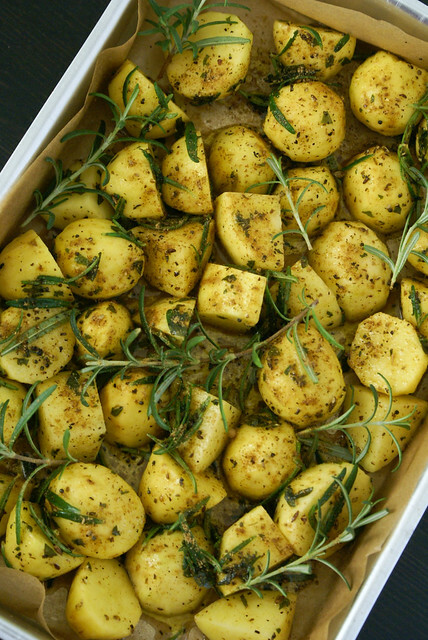 Potatoes and Rosemary are a match made in heaven. 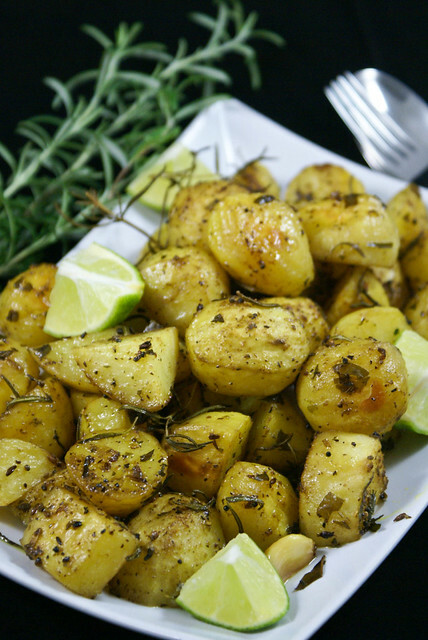 Since the weather is getting cooler…there is nothing more comforting than Roasted Potatoes with Rosemary. Wash potatoes, and cut them if using large ones. Transfer into a bowl and add oilive oil, garlic cloves and rosemary, salt and pepper. Toss well to coat. In a small pan, heat oil and add jeera, mustard and allow them to splutter. Turn off heat, add garam masala. Add this mixture to potatoes and toss again. Transfer the potato mixture to the greased baking dish, arrange them in a single layer. Add extra rosemary sprigs to the pan. Roast them in the oven till tender and crisp. It takes approximately 20 to 30 mins depending on how large the potatoes are. Serve hot with lime wedges. We had it with Sambar Rice! You can omit Garlic cloves if you want just the flavor of rosemary. You can even omit the tadka part. You need not peel the potatoes, but I personally prefer them peeled. 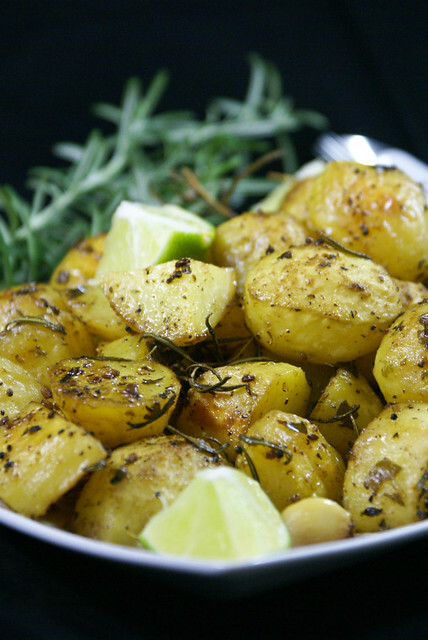 love roasted potaoes especially with herbs in it!! Yes Manju, the herbs add the extra flavor!! Its look awesome. 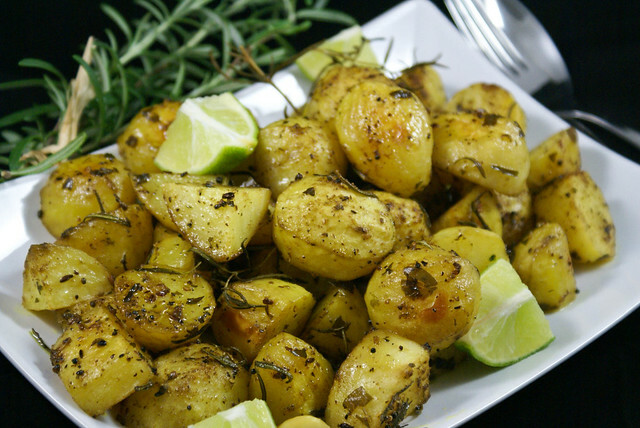 wow…Potato roasted with rosemary flavour nice idea. Perfectly roasted. Yes Kalyan it’s indeed very easy to prepare! You are right there’s nothing more comforting than potatoes. Whether they are boiled, mashed, baked they taste yum. I love the combination of the fresh rosemary and potatoes and that you gave it a nice tadka at the end. Potatoes look so perfect and the clicks are gorgeous. For Batura, sugar is to give that caramelized color and the yogurt is just for the sour taste. 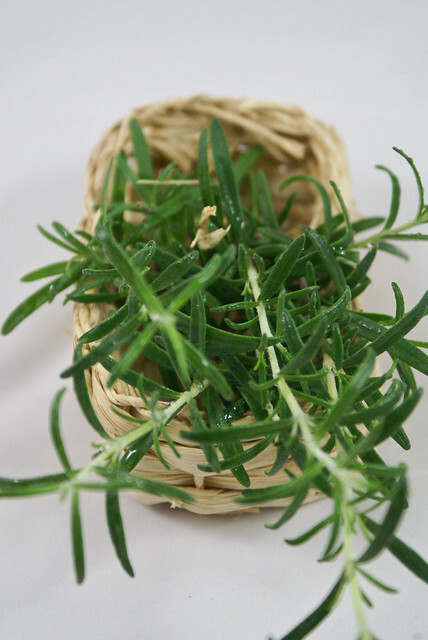 what is the name for Rosemary in telugu ? Hi Sri, Rosemary is an Italian herb. It should be available in some specific supermarkets like Q-mart in hyderabad. There is no telugu name for it. Hi, Rosemary is an Italian herb.. i am not sure it has a telugu name.. You can substitute it with any other indian herb like coriander or mint according to your taste.